If you put salmon on a high RS bagel that may actually qualify as healthy meal. Ok, don't get me wrong. I do not recommend making bagels, regular or resistant starch enhanced, a prominent part of your diet, but if you want to take a bagel along to the office, the high RS bagels Sarah A. Dainty baked for the experiment she conducted as part of the thesis she presented to The University of Guelph, may be a better choice - specifically if you fill your bagel with salmon or other high protein foods. Dainty conducted a randomized, double-blind crossover study to examine the glycemic effects of 8-week consumption of high-RS bagels (25 g RS) or control bagels in adults with a high type II diabetes risk (n=24). After being fermented, resistant starches act (partly) via the gut - health axis. 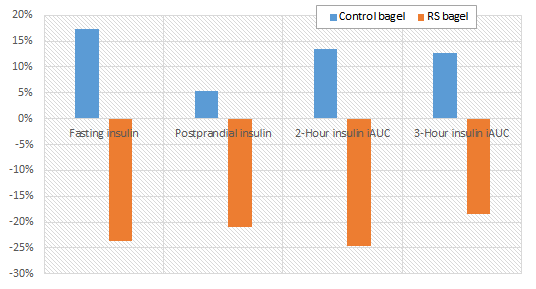 Dainty evaluated the fasting and postprandial (with an oral glucose tolerance test) glucose, insulin and HbA1c were measured before and after each bagel treatment. Table 1: Recipe for the dough the test bagels were made of (Dainty. 2015). Her results clearly indicate that the RS bagels, which contained 60% HS Maize (R) 260 (TM) as a replacement for regular wheat flour and 28g of gluten per kg to give the necessary extensibility and elasticity to dough, did not change fasting or postprandial glucose or HbA1c. Figure 1: Comparison of the effects of the regular and RS bagel on glycemia (Dainty. 2015). A significant inter-group difference was observed for fasting insulin, 2- and 3-hour insulin iAUC, fasting insulin resistance (HOMA-IR) and beta-cell function (HOMA-%B), though; and the use of resistant starch in the bagels also increased fasting insulin sensitivity (HOMA-%S), significantly. Table 2: Not all starches are created equal - overview of the 4 major forms of resistant starches (Dainty. 2015). The only problem that remains, though, was that the subjects liked the RS bagel significantly less than its regular cousin; and even worse - the taste didn't grow onto them (~7 vs. 5 out of 10 points). Since many subjects still reported that they might continue eating the RS bagel, it's not totally impossible that - after a few tweaks to the composition - RS bagels could actually be sold on the US market. If we assume that people actually buy them, their far-reaching effects on the satiety inducing and fat burning incretin hormones PYY and GLP1 (Zhou. 2015) this could tame, but probably wouldn't stop the rampant increase in obesity in the US. Overall, there's little doubt that Dainty's study "demonstrate[s] that high-RS bagel consumption improves fasting and postprandial insulin sensitivity and provide evidence for a feasible dietary strategy to reduce T2D risk" (Dainty. 2015). 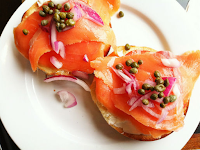 Accordingly there's little doubt that it may have a major health impact if the inclusion of 60% resistant starch in bagels became mandatory in the US. What remains questionable, though, is whether it may not be a much better idea to distance yourself from having a bagel everyday; or, at least, balance the high carbohydrate intake from bagels with high protein fillings instead of jam, peanut butter or Nutella | Comment on Facebook! Dainty, Sarah A. The Effect of Resistant Starch Bagels on Glycemic Response in Adults at Risk for Type 2 Diabetes. Diss. 2015. Zhou, June, et al. "The importance of GLP‐1 and PYY in resistant starch's effect on body fat in mice." 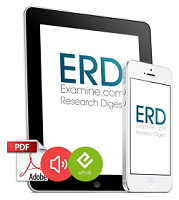 Molecular nutrition & food research (2015).